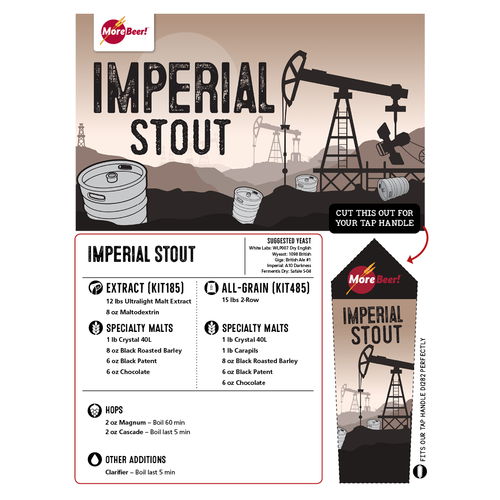 (Makes 5 gallons) Bubbling Crude, Black Gold, Texas Tea - you may not strike oil in your backyard, but you can make Imperial Stout at home. 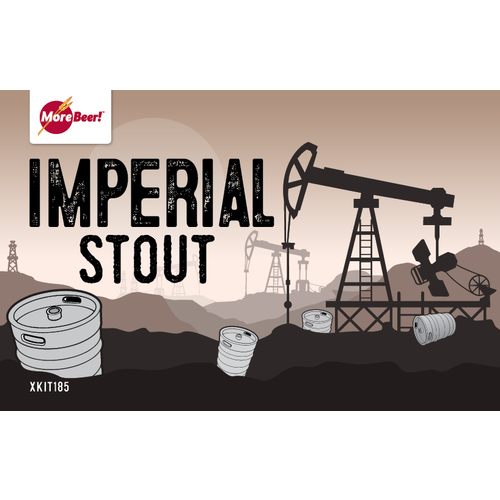 With a texture and color similar to black crude oil, this monstrous, thick, chewy beer takes a minimum of six months to age out. The foundation of the beer is 12 lbs of malt extract. Then we throw in some Crystal, Chocolate, Roasted Barley and Black Patent malts. Yes, there are two additions of hops in this recipe but you probably will never taste them through all that malt flavor. This is a great beer for sipping in front of the fire. Will age for years, eventually gaining some Port-like flavors. My favorite kit so far! It appears to be almost identical to a favorite recipe that is no longer available in my local area. what dry yeast would be best for this recipe? BEST ANSWER: I have made this recipe four times, and I used Windsor dry yeast each time. It is a great recipe! In fact, this recipe was the Grand Champion beer at the Spokane Interstate Fair in 2015. Nottingham yeast, make a 1 liter starter. How much yeast do i need?i donstseewhere it specifies. BEST ANSWER: Hi Richard - It depends on your OG but 2 packs of any suggested yeast will be suffice. You could also use this calculator: http://www.mrmalty.com/calc/calc.html Cheers! I love Imperial Stouts...but 8% seems way low. Is there anything to boost this kit to 9-10% abv? BEST ANSWER: Hi John - You could add more base malt or a couple pounds of table sugar. So far so good! 2 weeks in, I expect after transfer it should be better in 2-3 months. I woul give it 6-9 months but nothing lasts that long. I have brewed this twice. The beer is very dark, smooth, and rich in flavor. I keep the CO2 around 12 PSI in the kegerator. I used the WLP007 Dry English Ale - White Labs Yeast both times. This is a great stout kit! This stout comes out really thin. Not impressed at all. Brewed 15 gallons to put in a bourbon barrel to age and wished I had known it was going to turn out like this. Buy some dark lme to boost it up a bit. One of my favorites. Takes about 6 months to ferment in the bottle. I age another year then start opening. I have some that are 2 years old, keeps getting better and better. My last Imperial Stout was a homemade all-grain recipe. I got lazy on the next one and went with this extract kit. With an otherwise high grain bill, extract is much easier in my setup. I added cocoa nibs, chili pepper, oak and bourbon, so can't comment on the taste of the kit by itself. But it made a great base and tasters say the result is better than my all grain batch which had the same additives. I've made this one twice, once with S-04, and once with US-05 yeast. Much better with of 05. My only complaint is, it's not dark enough! This is the one I most want to keep for myself. It is stout-dark all the way and very bitter too, but neither in an unbalanced or bad way. I love that bitterness--it is totally by design and I'd have it no other way. I have bottles that are 9 months now, and it's the best bottle under my roof. My fav. beer is a pale ale, and on the dark side, this stout is #2, easy. I also find it is a worthwhile product as an extract batch, maybe no need to do all grain if you are meticulous and patient. I'm so happy with it that I will probably do it as extract again. *BTW, if you age this in secondary, (mine sat 2 months in cool-temp secondary) you absolutely need to add yeast at bottling. I used about 10g of the 11g S-04 dry yeast pack at bottling. This is one that just keeps getting better! This "Black Gold" is wonderful.., but it is not for the faint of hart. It has a bold taste that will linger for a wile on the pallet. The head is creamy and last for ever (or at least till you have your last sip). Aging is the key. You can enjoy it young, but patience is worth it. I just found several bottles that I had stashed and forgotten about over a year ago, I do not share these! This was the second stout I have ever brewed. I added 1 pound of organic chocolate nibs during secondary fermetation for a few weeks, I also added 1/2 pound of cocoa powder. A really smooth stout. Next time I will be adding a touch of milk sugar and some expresso. Everyone loved this brew it went rather quickly ! I brewed this and used a few additives during bottling. It was a fun little experiment. Try peppers, oak cubes, and whisky soaked oak cubes. Vanilla might also be nice but I haven't tried yet. Most of the trials were very tasty. I have brewed this kit a few times and it is one of the household favorites. Like others recommend, aging this one is required to get the best results. I have added Bourbon soaked oak chips to the last couple batches and that fits the style very well. If you like big stouts give this one a try. Great Stout if you can wait a year!! As a rule, I don't like stout beers, I brewed this for my daughter. Brewed it with the recommended yeast and let it bottle condition for 6 months, then opened one bottle a month till it hit the one year mark. Man oh man....it was good. I could drink this stuff, and I don't like dark beers! My daughter loves it and didn't want me to give any away. I gave some to my friends who like dark beer,since I don't drink the stuff, I really didn't know if really was any good or not. They all loved it! One described it as an alcoholic coffee. It looks like motor oil in the glass, but tastes great! If you can keep it for a year, it gets better and smoother as it ages. Down to my last 7 bottles and wish I had made more last year! Extremely meaty, sink your teeth into one! Very very good. Conditions well over time! You need to keep a batch going at all times because the taste is completely different as it conditions. Try to keep it in bottle for 6 months! Well aged for over 3 years - incredible!!!! Brewed 10 gal of this in the spring 2009 and after the recommended time in the fermenters, bottled and put away for Christmas. If my memory serves me right, I remember it being very potent and a little raw around the edges. Nevertheless it was gone in no time. I had the wisdom to stash away 6 - 22 oz bottles which I discovered a few weeks ago. 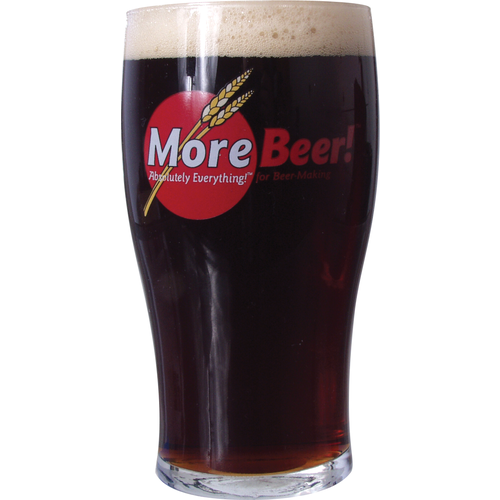 At celler temperature, slow poured into a pint glass, it had an incredible dense head. Bliss isn't strong enough of a word to describe the smooth flavor, porter-like as the recipe review promised, strong and perfect in all aspects, a true delight and sadly now just a memory. So- here I am getting more of it and couldn't help but share on this page. The theory / strategie this time: stash and throw away the key. Tried one at 3 month bottledmmarkmandnit is really good. Waiting for another 2-3 months tonsee how aging improves. Like Tim H above me, this was my first attempt at an Imperial Stout. I initially thought the half pound of maltodextrin would be a bit much, but the finished beer was nicely balanced, especially once we crossed the six month mark. Not as heavy or extreme as some Imperial Stouts on the market; a nice introduction to the style. It was my first Imperial Stout and it turned out quite well. I did fermenting in two stages and then bottled it. About 3 month after I boiled it tasted great.